Looking for the perfect gift for a friend or family’s little one? Why not give the gift of music? A Mini Maestros gift voucher is a wonderful gift for aspiring young maestros. You can choose the value of voucher you wish to purchase and the voucher can be used towards the purchase of an enrolment or shop item on this website. Upon purchase of a voucher using your credit card via the secure ANZ eGate Facility you will be emailed your voucher. The voucher will contain a unique code. Once received you can print it out to give to the recipient or simply forward the email to the recipient. The gift voucher is redeemed by entering the gift voucher code into the “Have a voucher?” field at our online checkout. Our gift vouchers are stored value gift vouchers meaning that they can be used multiple times until the initial value of the voucher has been exhausted or the voucher has expired. If the class enrolment or shop item costs more than the value remaining on the voucher the purchaser pays the difference on their credit card. Vouchers are valid for 12 months from date of purchase. Vouchers can be used online only at this website for purchase of Mini Maestros lessons and items (but not delivery) from the Mini Maestros shop. After purchase our gift voucher will be emailed to you. Please add the domain “minimaestros.com.au” to your safe senders list. If your voucher has not arrived in your inbox within 30 minutes of purchase and is not in your junk folder please contact Monika on phone 03 9850 5566 or email online.orders@minimaestros.com.au. 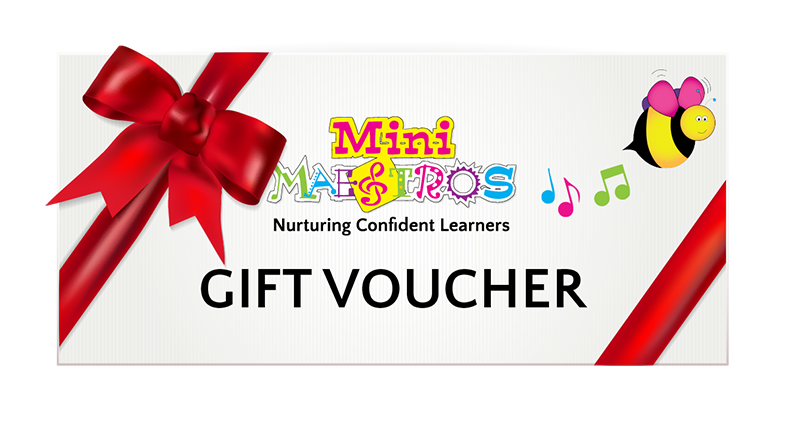 Our gift vouchers can be used online only at www.minimaestros.com.au for the purchase of Mini Maestros lessons and shop items (excluding delivery). The voucher cannot be exchanged for cash. Once purchased the voucher cannot be reloaded. Any remaining value on the voucher must be used before the voucher expiry date. The value remaining on a gift voucher can be checked at any time by contacting Monika.